While men are walking on the moon, in the hot July of 1969 life in London for sixteen-year-old Jane takes unexpected turns... In another starred review, Kirkus Reviews have described The Madness of Grief as a “well-written, richly complicated, and deeply engaging coming-of-age tale." 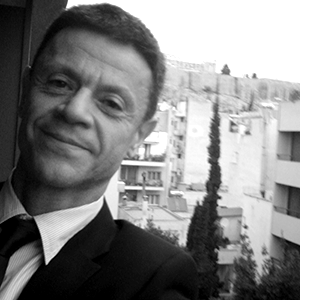 As in Panayotis’ previous novels, the story’s dramatic events are lightened by a touch of dark humour. Aside from reading, writing, and spending time with friends, Panayotis' favourite pastime is going to the movies, and ever since his friend/therapist/barber recommended The Sopranos, he has also discovered good TV. He travels to Cyprus often, to visit family and be near the sea.